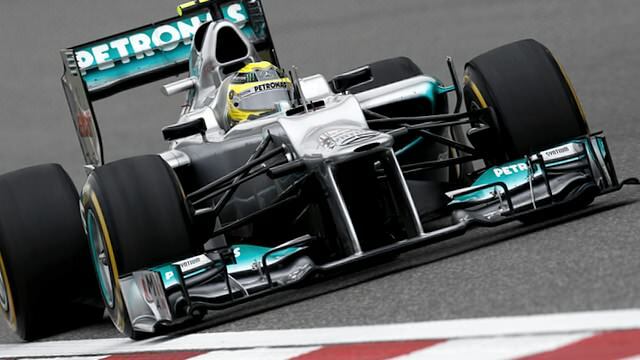 Welcome to F1Minute - Nico Rosberg takes pole position for the Chinese Grand Prix. Qualifying began in cool but dry conditions, with the initial session taking the expected form. HRT scraped through the 107% cutoff so are free to race tomorrow, but HRT, Marussia and Caterham were still firmly in the dropout zone. They were joined by Jean-Éric Vergne - the second race in a row he has qualified 18th. The big name dropping out in Q2 was Sebastian Vettel. The defending champion put in some consistent lap times that were just not fast enough, and he was gradually pushed out of the top ten, coming to rest in 11th place. Felipe Massa was just behind him in 12th. The final session saw Nico Rosberg put in a storming lap time, just as the temperature started to drop. The difference was enough that no one could make a dent on his half a second lead, and it was up to Lewis Hamilton to qualify second and Michael Schumacher third. Hamilton will take a five place gearbox-related drop, though, so it’s an all-Mercedes front row, whilst Kamui Kobayashi moves up to third.